There are lessons to be learned in failure, and even a wise old Jedi master like Luke Skywalker can fail to appreciate them. That's the cutting irony of Episode VIII in the Skywalker saga, "Star Wars: The Last Jedi." Written and directed by Rian Johnson (whose 2012 time-travel film "Looper" was an exceptional take on responsibility, revenge and self-sacrifice), "The Last Jedi" continues in the classical style of the previous "Star Wars" films, mixing bravado, humor, mysticism, action and exotic visuals with a core story of people trying to find their place in history. In this case, it revolves around three in particular: Skywalker, who has retreated to solitude because of his failure to prevent his nephew, Ben Solo, from being drawn to the Dark Side of the Force; Kylo Ren (Adam Driver), whose desire to mimic his grandfather Darth Vader seems less about power than sheer defiance of authority; and Rey (Daisy Ridley), who seeks Luke's help and finds a mentor instead. We'd been given glimpses of Rey's power over the Force in the last film, when she ably handled Kylo in a lightsaber duel, but she is ignorant about what the Force is and her connection to it, or her connection to Luke. By traveling to a windswept island on Ahch-To where Luke lives a hermit's existence, Rey draws closer to what her capabilities are, which to an observer might seem limitless. But that power is uncontained and not directed -- a raw energy that Luke (and Kylo) can see, appreciate and fear. Meanwhile, hotshot pilot Poe Dameron (Oscar Isaac) and First Order deserter Finn (John Boyega) have plenty of opportunities to exhibit their dashing derring-do, butting up against the forces led by General Hux (Domhnall Gleeson) and the malevolent Snoke (Andy Serkis in a motion-capture performance). Episode VIII follows in the pattern of the Original Trilogy, as the second act of a three-act drama, so there are issues that go unresolved while new strains in the narrative are opened. Just as "The Empire Strikes Back" is considered the epitome of the film series, because of its expansive familial drama, visual spectacle, and an ancient Jedi master performed by a puppet, "The Last Jedi" leaps ahead of "The Force Awakens," which managed to distill worlds, characterizations, plot points, and jokes to a new generation (some sniffed, slavishly so). But if history does repeat itself, at least "Last Jedi" shows that history can also be usurped. There are surprises here, even for fans. 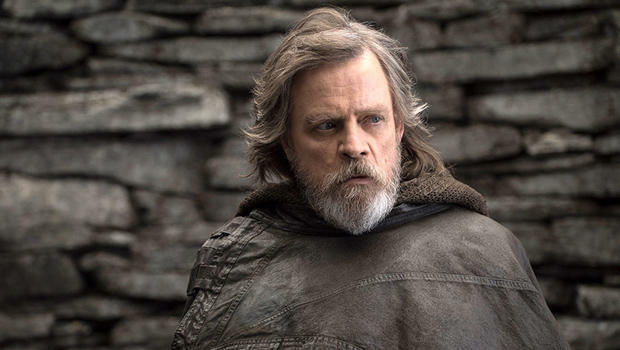 No surprise is Mark Hamill's performance -- his Luke represents the summoning of a lifetime spent wrestling with weighty matters of the universe as well as one's own hubris, and he evokes it beautifully. Ridley and Driver also bring heretofore unseen shades to their respective characters, which constantly unsettle where we think they are heading. The cast of characters expands notably, including Rose Tico (a winning performance by Kelly Marie Tran), who -- like the ex-stormtrooper Finn -- is a low-level operator who finds herself in the center of the action thanks to her considerable pluck and ingenuity; Benicio Del Toro is DJ, a thief and codebreaker who is conscripted to help the Resistance; and Laura Dern is Vice Admiral Holdo, who takes command of the dwindling Resistance fleet in a moment of crisis, only to spark another crisis. We are also introduced to new creatures, such as the crystalline foxes that populate a planet whose reddish surface is coated with white salt, and flightless birds dubbed Porgs. Like the Original Trilogy, the new film attests to the power of myths not only to tell stories but to alter destinies. And here, Rey is trying to uncover a myth that might answer the questions she has about her origin, not realizing that she has within herself the power to write her own myth. Indeed, one scene in particular which shows the power of myths to shape youth is perhaps the best manifestation of why "Star Wars" movies persist, and should continue, long after the Skywalker bloodline runs its course. Sadly, we know from life outside the "Star Wars" universe that actress Carrie Fisher will not be able to appear in "Episode IX." But we have her here in all her regal glory. Bravo, Princess. "Star Wars: The Last Jedi" (Disney/Lucasfilm) is now showing in theatres. Rated PG-13, because Porgs are edible. 153 mins.